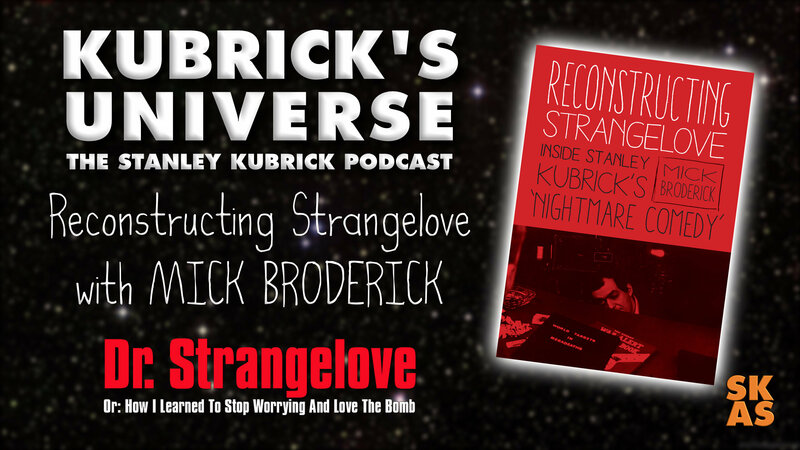 01 Mick Broderick : In this, our very first episode, Professor Mick Broderick speaks to Kubrick's Universe about his new book Reconstructing Strangelove. Mick Broderick is Associate Professor of Media Analysis in the School of Arts at Murdoch University in Perth, Australia, and also Acting Director of the National Academy of Screen & Sound, which a multi-campus research centre specializing in the production of creative works based on research in media, communication and culture. His first book, published in 1988, was “Nuclear Movies: A Critical Analysis and Filmography of International Feature Length Films Dealing With Experimentation, Aliens, Terrorism, Holocaust”. He has served as editor of three books, “Hiroshima, Nagasaki, and the Nuclear Image in Japanese Film”; “Interrogating Trauma: Collective Suffering in Global Art and Media” and “Trauma, Media, Art: New Perspectives:. His current book,“Reconstructing Strangelove: Inside Stanley Kubrick’s ‘nightmare comedy”, which he describes as a “research monograph” is about the movie’s genesis, development, and assumption of its final form, and sets the record straight about much of the lore that and legends that have grown up around the movie. The Sunday Times title for their review of the book was “Stanley Kubrick’s plan to flee nuclear attack foiled by toilet phobia”.